If you are a single mom feeling overwhelmed one of the key resources is keeping a short list of other adults on standby that you trust. See tips on how to incorporate this into your daily life for specific circumstances even if you don’t have family nearby. 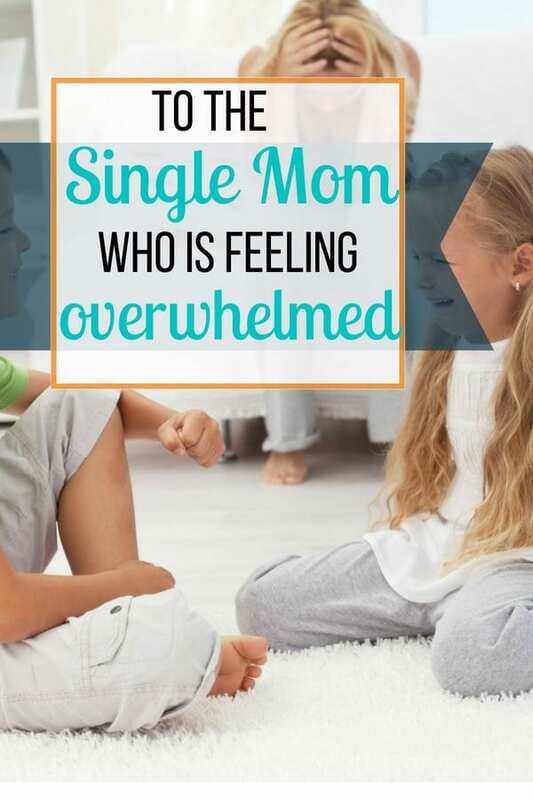 Are you a single mom that often feels overwhelmed? Do you think that you may need help sometimes but are unsure how to ask for it? Maybe it is only in certain situations that escalate. Perhaps you cannot handle the strong-willed child asserting her independence for the 100th time today by yourself. Maybe you cannot deal with hearing “I hate you” from your child again. You aren’t meant to do it alone all of the time. But, the reality it is, for a lot of us, we are. No one told us how to be a single parent. The hardest part about being a single parent is not having anyone to step in and take over when you are overwhelmed with the situation. When you are a single parent raising a strong-willed child, or a difficult child or whatever label you want to put on it, your life intensifies. There are arguments, “fits” that long outlast what many call the Terrible Twos, yelling matches, kids that leave the house, and more. And you are supposed to be “in-charge”. How funny. You do not feel in-charge at all. All you are doing is yelling. As a single mom, you can feel like you should do everything yourself, including diffusing situations. But when that ignited situation is between you and your child you need another adult to step in. But there is no other adult. One of the best ways to get help is to keep a short list of other adults on standby that you know and trust. This is doesn’t have to be family. Often introducing another person into the house will change the dynamic. You and your children will not continue to fight, yell, and act the same if someone else is in our house. Be picky about your short-call list. Sensitive to your situation. It can be embarrassing to admit that you can’t control one of your children or that you need help. You want 2-3 people that you can call in confidence. You don’t have to tell them everything. Only the specific situation you need help with right now. Someone who understands your child. Your child is most likely not simply being a brat, you want someone who understands their needs. What you are looking for is someone who will not necessarily solve your issues but give you both a break. You might simply be feeling overwhelmed with single parenthood. Other moms get to have the dad take over for a bit. We don’t. Use this person for a half hour even once a week or a month. They can take your child outside for fresh air and let you have some alone time to cool off. You do not want someone to come over and take sides. Maybe just watch TV with your other child who is often ignored during these times. As mothers, we are so emotionally involved in the situations, we cannot look at the situation the same as an outsider. Even a grandparent, who loves both parties, is less emotionally involved. A grandparent’s love cannot touch that of a mother and child. It’s okay if you don’t live near family. I used my next door neighbor as well as my mom. My call list included my mother, who would come over and bring her little dogs. She would take my child outside with the doggies and they would go for a walk. The dogs and the outside were refreshing. Also on my call list was my neighbor. I needed someone nearby. He didn’t know the specifics. He could only see I needed a break. He played with the kids outside. That was it. Both these people loved my children and understood the dynamic in my house. It was (is) a house full of love that was simply going through a long rough patch. The last thing I needed at the time was someone with a judging eye or someone to give me lectures. Pride can sometimes prevent you from knowing when to call in the reinforcements. My kids reached an age when they began calling in the reinforcements themselves. Grandma showed up unexpectedly with comforting dogs in tow. Admittedly I may have felt like I was being undermined, but my daughter was right to call if she was uncomfortable. Whether your kids are 3 or 13, if you are struggling right now keeping the peace in your home, I encourage you to find a trusted friend or family member you can call before it gets to be too much. Find someone you trust 100%, that you don’t have to explain yourself or your children to. It DOES get better. When you are in the middle of it, it doesn’t seem like it ever will. However, it can take a long time – especially if your children are experiencing issues from your separation – that’s why you can’t do it alone 100% of the time. Ask for help. It’s humbling. But it’s worth it.